This litter is between two complimentary dogs who are lively and kind, capable of work and play without being hard headed or overly stubborn. They will be smart. 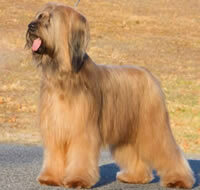 Like the current litter and my previous litters, these will be of sound and correct type to the entire breed standard. These pups will make good companions, and also will be good dogs for performance people: obedience, agility, rally, etc. Typically I have again combined in these two beautiful dogs, some outstanding working dogs from both their backgrounds. The blending I hope will make nice quality pups that maintain the type you see in the photos. Never expressed before by me because it is only of interest to future breeders, but always in my decision making process, I take into account the ease and strength of good producers, based on the pedigree history. 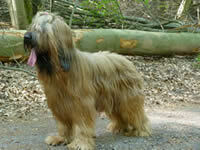 In this way I am contributing Briards with wanted traits who produce well. Without that, the future of the breed faces problems. The movement of these dogs will be a pleasure to watch.